I feel extremely lucky. I live in an area of natural beauty (The Chiltern Hills). I'm close to London and some of the UK's most prized heritage and rural assets. One such place that is Ashridge Estate near Berkhamsted. All open spaces and deep woodland, footpaths, a cafe and shop and a monument. It has some amazing wildlife (a deer rut takes place there) and is perched on top of the Chilterns with beautiful rural villages close by, Aldbury being one. Love your Midsomer Murders? Well they film it there quite often. It's also extremely popular to visit. On any given weekend when the sun is shining the avenue towards the monument is a sea of cars and picnickers making it a perfect place to visit. There are so many routes to choose from, this way and that. Head towards the manor house or the monument? Or take a longer walk and arrive at Ivinghoe Beacon and a look across the Vale of Aylesbury. Choices, choices. We chose a circular route around the large green space near the cafe and shop that I imagine where the deer rut takes centre stage during Autumn. I could be wrong? 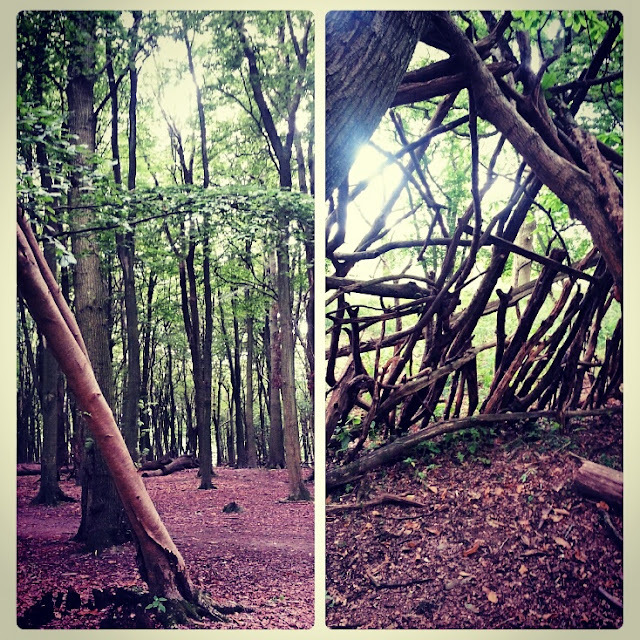 Whatever walk you choose it's lovely and there are plenty of dens for kids to play in and trees to climb on. Seems to be some trend as you walk around, dens everywhere. All well constructed, would be a great shelter if you added leaves to it. Must be one of the National Trust's activities they run? Great fun. We should all get out there and build dens. Pull yourself together! I've been up the two tallest structures in the world this year but can't handle 100 ft of concrete. It's the railings, I kept telling myself. The monument is the centrepiece of the estate. 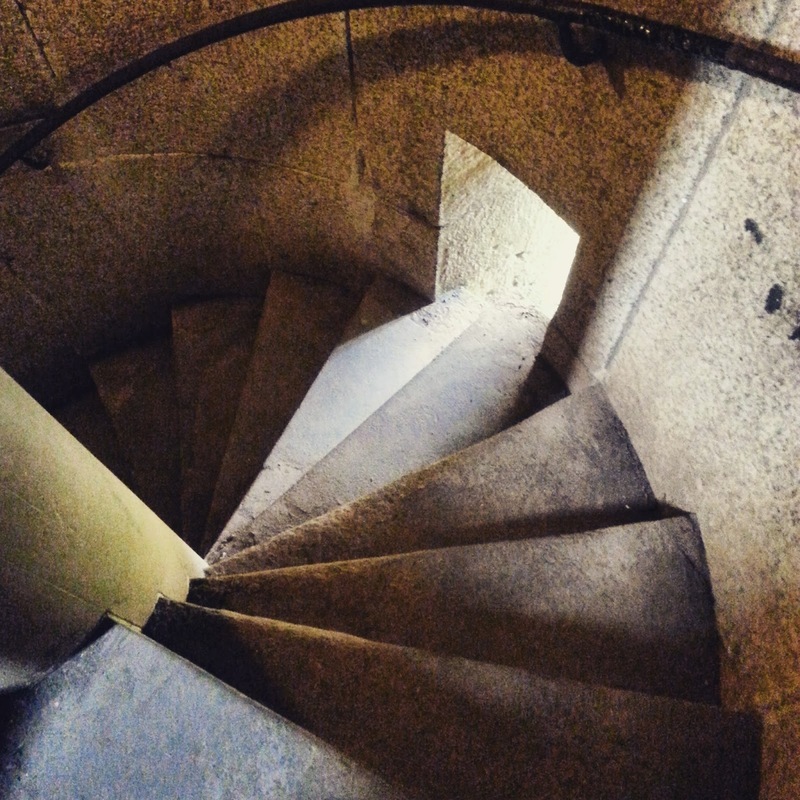 For a small fee (unless a National Trust member) you can climb it. Just don't look down! Look to the horizon. That's what I told myself anyway. Apparently you can see The Shard in London. I didn't hang around long enough to look for it! If you're one for climbing monuments then Ashridge ticks that box. 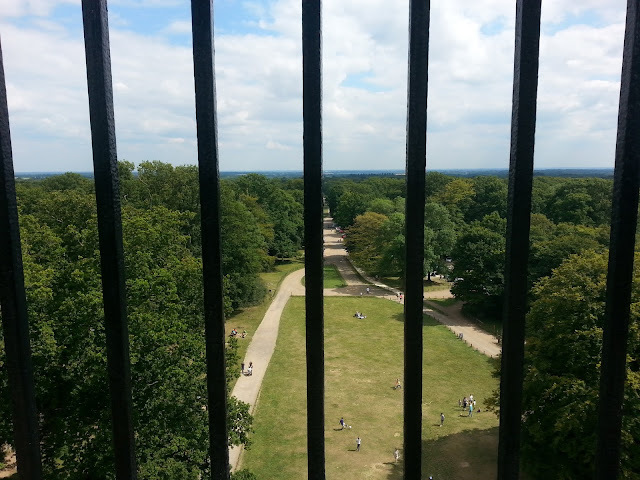 In all honesty you do get a great view, its just the railings! Are they really safe? That's better! After all that walking and climbing (and getting down quickly!) time to rest with a nice cake and a cuppa. They do good cakes in the cafe, promise. The scones are huge. After that you can educate yourself with a potted history of the estate, what to see and do (oh, perhaps visit there before you walk!). It's all beautifully done, and it's always busy. This is where the National Trust get it spot on. A nice cafe, a little shop, activities for the kids in stunning surroundings. Perfect. So if you're passing through Herts and Bucks (the estate runs through both counties!) why not stop off for a stroll, a cuppa and a scone. You could do worst things? And it's free! Ashridge Estate is a place full of adventure and discovery and will delight young and old, as it always does on our frequent visits. I am really lucky and thankful for being so close to such a beautiful place. Have you been or is there a similar place near yourself? I'd love to know and lets share in our adventures.